3 Tier Mobile Tire Rack , 2 pneumatic tire model, rolls easily on big 16" pneumatic tires when coupled with No. 1898 Tote Jack. * - Has big 16" pneumatic tires. - INCLUDES locking bars & lock and deluxe swinging sign hardware. 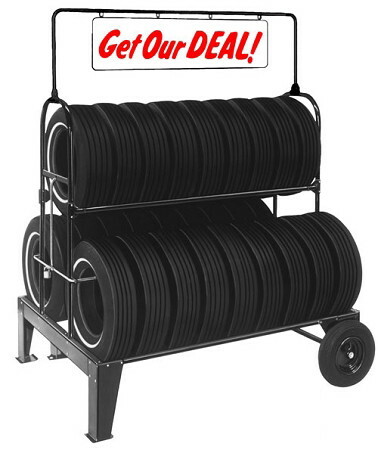 - This rolling rack can display 24-27 tires. - Includes your choice: "Get Our Deal!" or "TIRE BARGAINS" sign in red/white or blue/white.